In August I hit two major goals I set for myself on January 1st of this year, and they were two goals I didn’t think I’d achieve. I surpassed 2,000 miles ridden and I did it just before completing my first century (100 mile) ride. Up until this year, I’ve always ridden about 600-800 miles between May and October and this year I pushed myself to ride all the way through Winter. I’m guessing I’ll be hitting about 3,500-4,000 miles for the year by the end. The century went really well and didn’t feel like a 7 hour day in the saddle even though it was. The first 80 miles were pretty easy and a blast, but riding into a headwind the last 20 was kind of exhausting and I was glad to be finished at the end of the day. 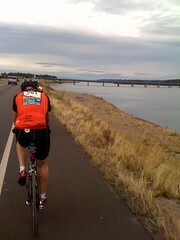 I also did the century ride to prepare myself for Cycle Oregon, which kicks off in less than a week. I knew even the worst day at Cycle Oregon (a 77 mile day with about 7,000′ of climbing) would be a bit less distance then the century (and the Portland Century featured about 5400′ of climbing) so if I could do the century, I should be ok for Cycle Oregon week. On the diet front, I’m still down around the same weight as last month. Kind of frustrating that I haven’t really budged in several months, but overall I’m about 12lbs lighter than I was at the beginning of the year and I haven’t yo-yo’d back up, keeping fairly steady for the past few months. I’m hoping a hard week of riding at Cycle Oregon will kick off another five pound loss, though it sounds like they will be feeding us like crazy at every meal. Still loving the Rapha gear that you got? (knew this via twitter) Curious if itâ€™s held up to all your wear and tear. Yeah, most definitely. I’ll write up a post near the end of the year about all the gear I’ve gone through this year, but every piece of Rapha clothing I have is still in perfect condition and is easily the most comfortable stuff I own. I know they’re super expensive (shorts run about $200 and jerseys start around $150), but the comfort and performance of wool even in the heat of summer has made them worth every penny. I can’t say enough good things about them, the fit is perfect, the comfort high, and they’re durable enough that I’ve never seen a mark on them even after doing some gnarly singletrack in some overgrown woods (that left multiple cuts and bruises on my legs and arms, but the rapha stuff held up). Congrats on the 2km and 100m, that’s huge. I’ve only put 800m on my Wilier since getting it in Feb and sadly those are mostly commuter miles, not much distance. Strange about the weight loss, but keep focused on eating right and you can’t go wrong. Still loving the Rapha gear that you got? (knew this via twitter) Curious if it’s held up to all your wear and tear. Don’t get too obsessed with your weight, you should also see how your clothes are fitting. If they’re getting looser, you’re doing well. Muscle weighs more than fat, so you can be losing fat but not noticing much scale movement.